I was standing in the British Library in London looking down into a museum cabinet where beneath a layer of glass, lay an original map of Mordor. 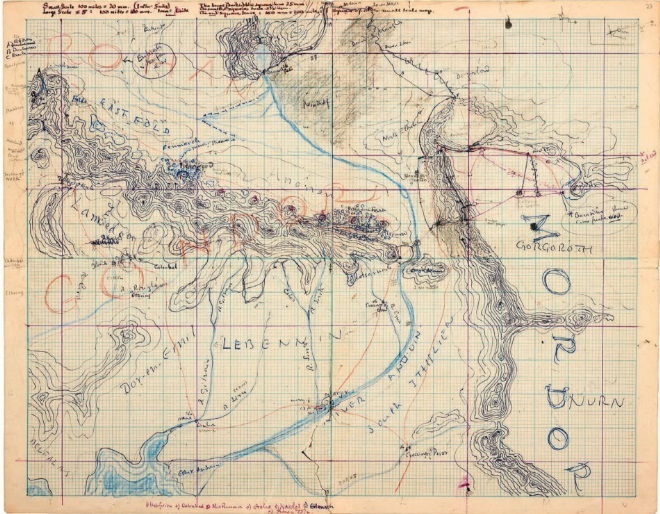 Hand drawn on graph paper by Tolkien’s son Christopher in 1948.
it was used by his father as an aid to plotting out the third book of Lord of the Rings that was to be published in 1955. 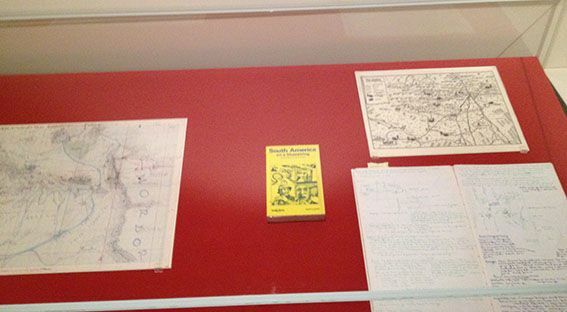 And just to the right of it, in the very same cabinet, was my (yes you read that right) my hand drawn map of Central Australia that I’d created for Lonely Planet’s 2nd edition of Australia back in the late 70’s. It wasn’t a total surprise to see it there. And certainly the thought plus the sight of my creative energies swirling around in the same cabinet space as Tolkien’s – was a little heady! Maps and the 20th Century: Drawing the Line. The overall theme being that come the 20th century, maps no longer were merely navigational for telling us where we were in the world, but rather they were being used to tell us more about who we were – maps were being used as a tool to influence our thinking via propaganda and marketing persuasion. 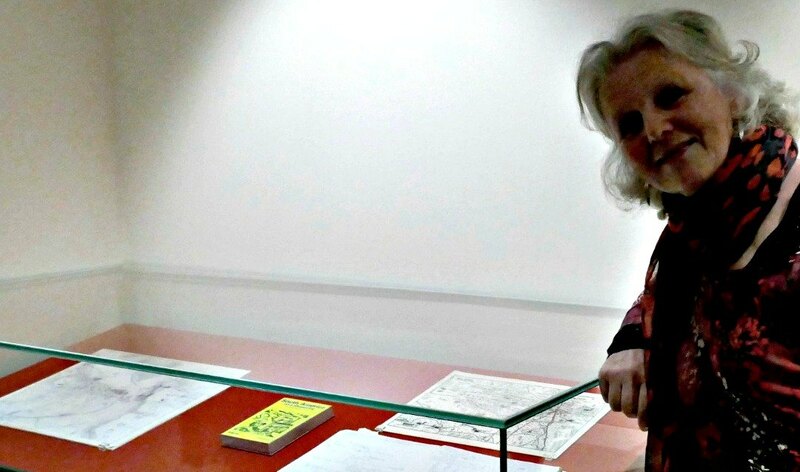 “I’m briefly in London and have just been to the opening of the British Library’s ‘Maps and the 20th Century: Drawing the Line’ exhibition. It’s open until 1 March 2017. They said they have 4 million maps in their collection, there were several thousand they considered using in the exhibition and your ‘The Centre’ map was one of the 200 actually on display. What is particularly nice is the display case with your map, the Geoff Crowther Central & South America notebook and the 1983 edition of Geoff’s South America on a Shoestring, also includes a map of Middle Earth drawn by Tolkien in 1948 and used by him as he plotted the activity as he wrote Lord of the Rings. So you’re in a display case with Tolkien and the British Library also displays Gutenberg’s Bible of 1455, an original Magna Carta, the Lindisfarne Gospels, the Codex Sinaiticus, Leonardo da Vinci’s notebook, Handel’s Messiah – in the composer’s hand, Beowulf and handwritten lyrics by the Beatles. The exhibition – was on display from November 2016 through to March 2017, so when in the UK visiting family I naturally made a detour to visit London and see the show. While some were beautifully artistic and inspiring, others were heartrending as they conveyed the destruction of war; some were political and clandestine, while others took you on a hop skip and a jump back to childhood with board-games with maps as their central theme, and pages from the UK Automobile Association’s personalised map itineraries (which for me brought back many happy memories of map reading in the back of the car as a real live Sat Nav directing my father to turn left and right as we headed off on summer family holidays to the hills of Snowdonia in Wales or the North Western Isles of Scotland); as well as the simply gorgeous end papers from Winnie the Pooh, with the map of 100 Aker Wood. Central Australia -The Middle Earth of Australia! Central Australia is situated, as its name implies – in the very middle of this island continent – miles from the sea in any direction. It is a world of wonderfully unique vegetation, animal species and landscapes – not to mention, amazing people! Gazing through the glass into the cabinet looking from one map to the other – I was drawn into the notion that in each of their own ways, both were a ‘Middle Earth’ of kinds. The two maps both represented ancient lands, steeped in complex stories from long, long ago. It was fun reconnecting with a map I’d last seen nearly 40 years earlier when I’d popped this original pen and ink drawing on draughting film into a tube and posted it off to Tony in Melbourne where the artwork was laid out in preparation for the press. But in the end, the connection is that these two maps have travel at their core. 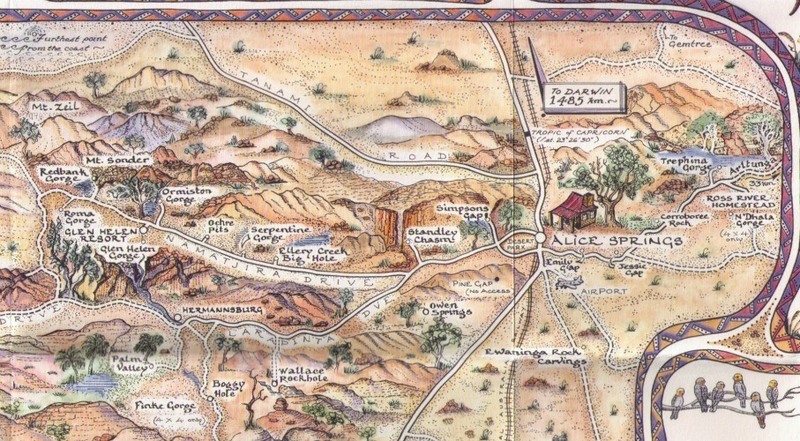 I was fascinated to read Mark’s comment in the section below how a Mordor exists to the NE of Alice Springs – and thus on the right edge of my Central Australia Map! My Map Journals are designed to highlight your adventures by simply dotting your route on the map and jotting your travelling tales in the surrounding illustrated boxes – a visual keepsake that will keep that holiday smile on your face… forever! Have you read the Lord of the Rings and/or seen the films? A real life landscape where stories older than time await discovery. 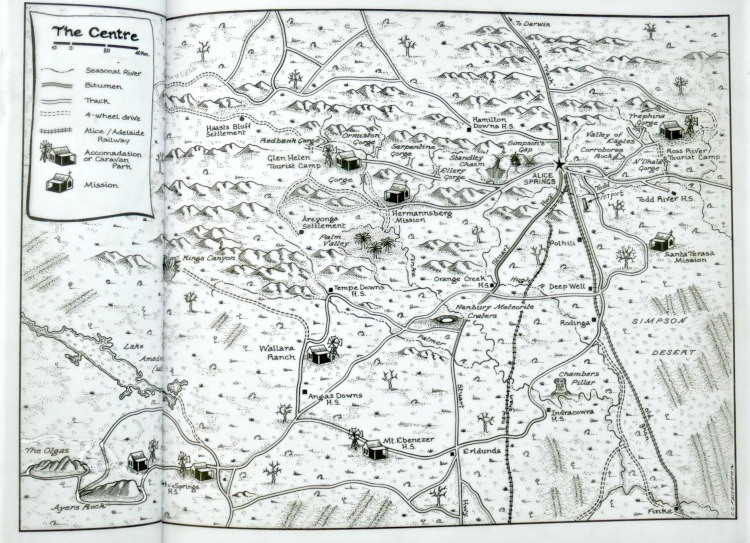 This entry was posted in Maps, NEWS and tagged british library, maps, maps_in_literature, pictorial_maps by Linda. Bookmark the permalink. This is so utterly wonderful. Congratulations on finding your work deserving of such august company. 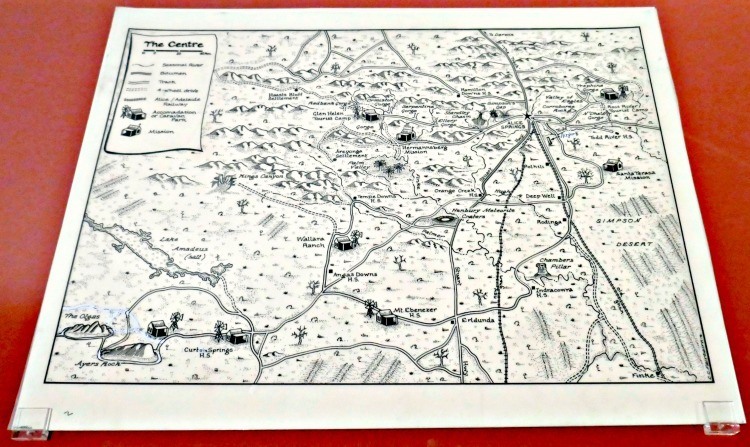 We visited the British Museum a few years ago; alas, when the map exhibit was still yet a gleam in a curator’s eye. Its fun being part of history and how the art of cartography is forever evolving! Oh Linda, I’m so very happy for you. What an honor indeed! It must be fantastic to have your creative work on display in such an important venue. I like the concept of maps showing who we are. Beautifully done, my friend! Yes, Maps really do say so much more about us than just where we are in the world!! It was a very warming feeling indeed! Oh, I feel so honored that you commented on my humble little post, you who have been honored so much for a treasured hand-drawn map displayed at the British Library together with Tolkien’s! Cartography is such an art! LOL – you are funny! What a great story. But I am annoyed with myself because I was actually in the British Library (doing some research) a week ago and I missed this! Going to the British Library ‘just’ to do some research sounds pretty heavenly to me! 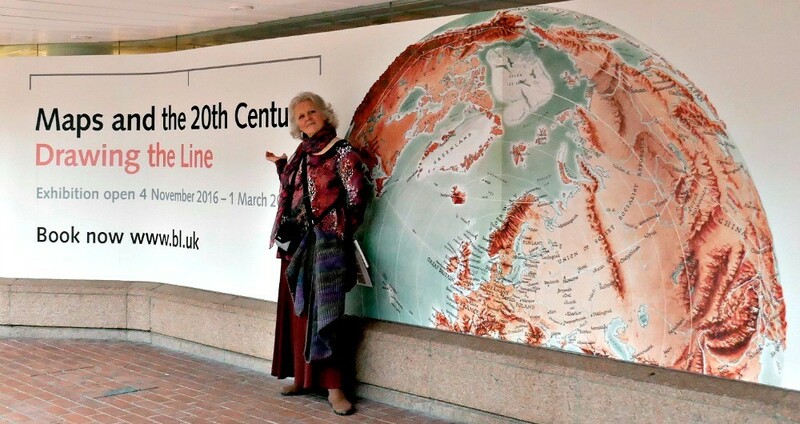 What a fantastic life you have led and to see your work in the British Museum in such a prominent place…WOW!! Thank you for sharing your accomplishments along with your journey!! Life’s journey takes us on such a merry dance! Amazing. Displayed in the BM alongside a map of Mordor! Pretty heady stuff! I love Lord of the Rings and The Hobbit….”not all who wander are lost”. It is amazing to be on display in such an incredible institution, alongside such eminent company! How exciting to have something you created displayed in a museum. I love maps. Maybe that’s because they have travel at their core! Its a little unreal isn’t it the thought that something you drew should be museum worthy! I love your map, and to have it exhibited right next to Mordor! Wow! 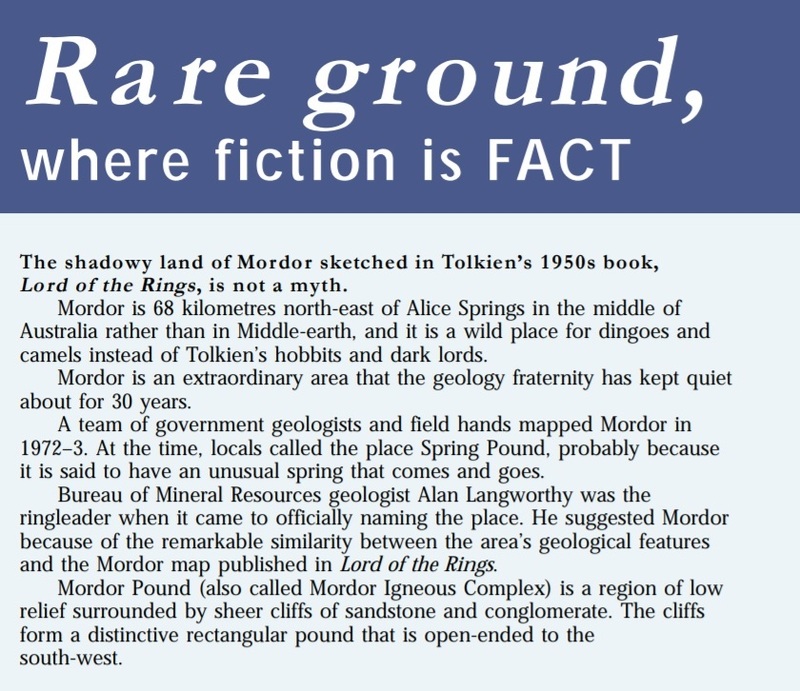 I remember poring over that Mordor map every time I read Tolkien, and that was many times. Congratulations! So impressed! You are a real cartographer! I love the whimsy that now characterizes your style! What a great achievement, congratulations! 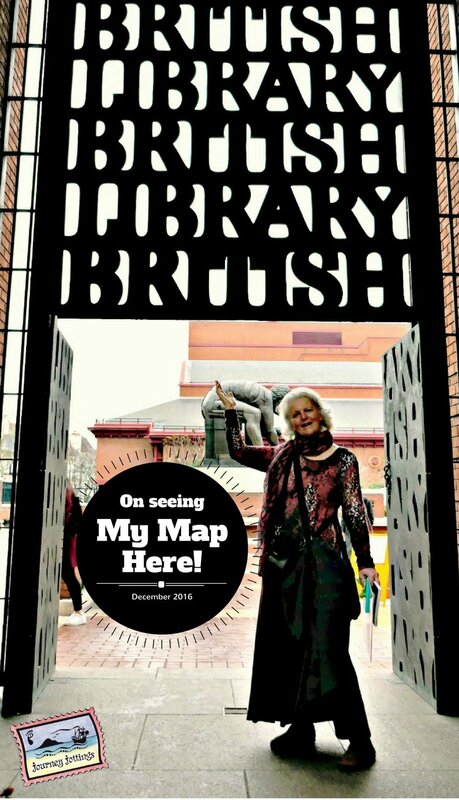 I love your maps and to have one exhibited at the British Library in London, no small feat. Chapeau! As a lover of maps per se it’s a great feeling to have one of mine included in such an exhibition – in such an awe inspiring institution – *Bow*! Wow, you are famous! I’m so happy that such an accolade was bestowed on you, and how lovely that you could get to see the exhibition. Your beautiful maps should be artworks in themselves, to hang on walls – they can be gazed at for ages, and I for one just enjoy imagining the places you depict in your lovely whimsical style. I had seen this news already and commented on Facebook, but have only just found the time for some blog reading. I loved the story you wove around your success, bringing it all together – I especially liked your comparison that both Tolkien’s map and your map , “represented ancient lands, steeped in complex stories from long, long ago.” So true. Well done again! Like you Jo “I dwell in possibility“ (quote Emily Dickinson) and we both know where that can carry us! Wow! What a proud moment in time for you! As you know I’m a big fan of your work, and this is just stunning. Good for you! Amusingly my very first job when I left home and moved to London was working at Casa Pupo in Pimlico in their Tile Shop selling Spanish and Portuguese tiles to architects and stars wanting something beautiful in their bathrooms and kitchens! The Portuguese blue and white tiles were always my favourite! What a totally amazing piece of information! I’ve taken a look at a few maps and it appears, even more amazingly, that Mordor is within the bounds of my little map!